Do you have a door that won’t open because the lock latch won’t retract enough to open the door? If so, here’s how you can fix it. 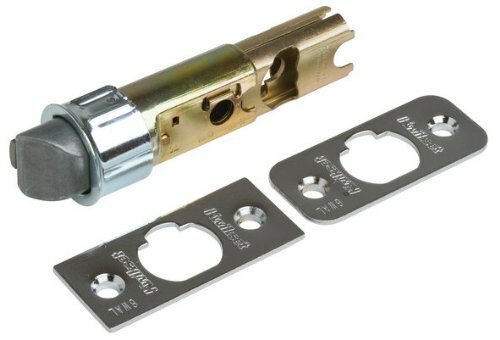 New dead latch – buy after you take yours out. First off, you’re going to have to take the door handle off. You can do this by using the phillips head screw driver to unscrew both screws on the door handle. Make sure the lock is unlocked before you do this. Once you have the door handle off, you can now try to open the latch manually with either a large flathead screwdriver or pair of needle nose pliers. You can see where the cylinder entered the dead latch mechanism and pulled the latch back. On the Kwikset locks, this looks like two little teeth that the cylinder pushes back. You may want to spray WD40 or other lubricant on the lock mechanism. If this works, then you can open the door and it’s time to replace the dead latch. To take yours out, just use your phillips screw driver again to take out the two screws in the face plate. Now go to the hardware store and buy you a new dead latch. The 2 liter pop bottle thing worked! Saved me a hefty locksmith bill. Thanks! Awesome! I’m glad I was able to help. Wow, the bottle method worked like a charm. Thank you! You saved the day more than you know. my 10 year old’s door rod failed with her in her room on a day that is 105 outside. As her windows do not open (it’s a play area not a bedroom) and the only circulation is from a fan it can get hot FAST. The soda bottle trick worked like a charm. Rod mechanism being removed as we speak. I have a 9 year old, so I know how scary that would be. I’m glad I was able to provide a solution for you. Thank you for sharing your story with me. I used a piece of bailing wire and formed it into a “U” shape to pass it around the rod mechanism (from the inside) and simply pulled it somewhat vigorously and as the latch retracted and I pulled on the door and it opened. Then I had to replace the rod mechanism.